There is a legendary account of a mother and her three beautiful daughters who suffered martyrdom during the reign of Emperor Hadrian. It was claimed that the mother, the Roman matron Sophia (Wisdom), and her three daughters, Pistis, Elpis, and Agape (Faith, Hope, and Charity), underwent martyrdom for the sake of their Christian faith and were interred on the Aure­lian Way. Although we don’t know much beyond scanty pieces of information alleged to be about them, I am inspired by their names to think about how the grace of martyrdom flows from faith, hope, and charity. In this chapter we will consider the connection between faith, hope, and charity in our Christian journey. St. Paul, in his first letter to the Corinthians, describes the gradations of these virtues and concludes by emphasizing that love is the greatest of them all: “So faith, hope, love abide, these three; but the greatest of these is love” (1 Cor. 13:13). The blessed apostle gave several examples clarifying that faith without charity is nonsalvific, but he did not explicitly talk about the connection among the three virtues. That will be our project here, in order to help us to appreciate that Christian faith and spirituality is based on the mystery of the Incarnation and connects us with one another. Christian faith is incarnate faith. There is no faith in the abstract; rather, every person is called to participate in the mystery of the Incarnation and to live it out daily. It takes two to have faith: God and a human being. It takes two to have Christian faith: Jesus Christ and the Christian. Jesus is our hope, our salvation. An incarnate faith is grounded in the mystery of the Incarna­tion — that in the fullness of time God became man in order to save us (Gal. 4:4). Jesus revealed to us the divinity of God, making it possible for us to enter into a profound relationship with Him. Jesus’ incarnate nature builds us up not only as individuals but also as a community — the Mystici Corporis, “the Mystical Body of Christ” — making it authentically and distinctly Christian. Christian faith does not work in isolation. Christian faith means identification with and incorporation into Jesus Christ. In addi­tion to the choice of accepting Jesus as our Lord and Savior, we become Christians when we are incorporated into Christ and His Body, the Church, through baptism, which is rightly called the first sacrament of initiation. In this sacrament we are brought into Trinitarian belonging as Christ commanded His apostles to baptize “in the name of the Father and of the Son and of the Holy Spirit” (Matt. 28:19). Through this incorporation, what is personal becomes ecclesial. Christian faith is personal because it is the individual who makes a personal commitment to be a disciple of Jesus. As Pope Benedict XVI put it, “The act of faith is an eminently personal act that takes place in the most intimate depths of our being and signals a change in direction, a personal conversion. It is my life that is marked by a turning point and receives a new orientation.” Continuing, the pope states, “My belief is not the result of my own personal reflection, nor the product of my own thoughts. Rather, it is the fruit of a relationship, of a dialogue that involves listening, receiving and a response.” The personal aspect of the Christian faith relates to its subjective dimension. This article is from “Our Journey to God.” Click image to order in paperback or as an ebook. But the Faith is also ecclesial. To paraphrase Pope Benedict again: Every Sunday, we individually recite the Creed as the summary of “our Faith,” not just my Faith. It is therefore the Faith of the community of believers. All through the early Church, as recorded in the Acts of the Apostles, those who accepted Jesus in their lives also became members of the way through baptism. They were faithful to the teaching of the apostles and fellow-shipped together, united in the breaking of bread and also in the life of prayer (Acts 2:41–42). The ecclesial nature of faith is beautifully described in the Catechism of the Catholic Church: “ ‘Believing’ is an ecclesial act. The Church’s faith precedes, engenders, supports and nourishes our faith. The Church is the mother of all believers. ‘No one can have God as Father who does not have the Church as Mother’ (St. Cyprian, De unit. 6: PL 4, 519)” (no. 181). Christian faith is therefore essentially communal. It neither ig­nores nor excludes the ecclesiae — the Church — whose head is Christ. Individualistic faith isolates itself and thus loses the core ingredient of its Christian identity. This is why true faith is essentially communal. Christian faith connects us with God and with each other. It is Christ centered and at the same time charity oriented. It inspires us to love and to relate with others as children of God. Christian faith in action is charity. Similarly, Christian faith is teleological; it will not find its consummation until it reaches its object, God’s Truth, and its ultimate goal, eternal life. This teleological aspect of the Chris­tian faith — that is, the idea that faith is ordered to some end or goal — makes it intricately connected with hope. Just as the work of faith is charity, its expectation is in hope. Faith possesses in a limited form that which is hoped for; it looks up to the final consummation in the life to come. It is like the kingdom of God, which is both now and not yet. The ultimate goal of faith — the Beatific Vision, eternal life — is not to be reached unless faith is sustained to the end. Faith alone, although it originates from God, is not sufficient in itself to reach this goal. But its foundational value is not to be ignored, for without faith, no one can please God (Heb. 11:6), and the righteous is “justified by faith” (Rom. 3:28). How then is it that faith, in itself, is not sufficient to reach the goal of the Beatific Vision? The answer is found in Scripture, which exposes the communal and teleological dimensions of the Christian faith. Trying to separate faith from the other two theological virtues is like choosing between the lyrics and the music of the Christian journey. James went right to the point: “Faith by itself, if it has no works, is dead” (James 2:17). And St. Thomas Aquinas’s teaching that “faith may be without charity, but not as a perfect virtue” expresses the same idea. When Mother Teresa of Calcutta culminated her faith journey in India, her exceptional acts of love and works of faith on behalf of the people became proofs of her faith. When Charles Lwanga and his companions in Uganda graciously accepted death for their faith by extending a hand of welcome and prayer of forgiveness for their executioners, they were not only confessing their faith, but showing its connection with hope and love. Think of the Christian missionaries from Poland, Portugal, Ireland, England, Spain, and America, who traveled to differ­ent parts of Africa during the most volatile and vulnerable days of evangelization. They were not deterred by mosquito-borne diseases and other dangers. They could not have been motivated by faith alone in exclusion of hope and love. They believed in God; they hoped in the future glory; and therefore they loved unto death. The concept of “substance” is therefore modified in the sense that through faith, in a tentative way, or as we might say “in embryo” — and thus according to the “substance” — there are already present in us the things that are hoped for: the whole, true life. And precisely because the thing itself is already present, this presence of what is to come also creates certainty: this “thing” which must come is not yet visible in the external world (it does not “appear”), but because of the fact that, as an initial and dynamic reality, we carry it within us, a certain perception of it has even now come into existence. Correspondingly, Christian faith, like Christian hope, is not faith in progress, whose goal is the triumph of reason over religion. Faith in progress is a purely mechanical and materialistic notion of faith that evolved in response to the rise of Marxism and communism. In our age it is intertwined with economic liberalism and the prosperity gospel. Christian faith is interwoven with hope and love. Hope sustains it, and charity makes it incarnate. Charity is “the theological virtue by which we love God above all things for His own sake, and our neighbor as ourselves for the love of God” (CCC 1822). Aquinas’s view is grounded in Scripture. St. Paul taught that of all the theological virtues the greatest is love (1 Cor. 13:13). Love, here called charity and understood in this context as Chris­tian love, never fails, because the goal of our faith and what we hope for is the presence of God — and God is Love (1 John 4:8). Thus, although faith and hope can exist without charity, they are not perfect and Christian without charity. Wherefore just as friendship with a person would be impossible, if one disbelieved in, or despaired of, the possibility of their fellowship or familiar colloquy; so too, friendship with God, which is charity, is impossible without faith, so as to believe in this fellowship and col­loquy with God, and to hope to attain to this fellowship. Faith dovetails with hope and matures in charity. The life of faith is truly redemptive if there is hope for a future glory and a true friendship with God, which is charity. The work of Christian faith is charity, and the eternal expectation connected with it is hope. The journey of faith means growing in all three of these essential virtues. 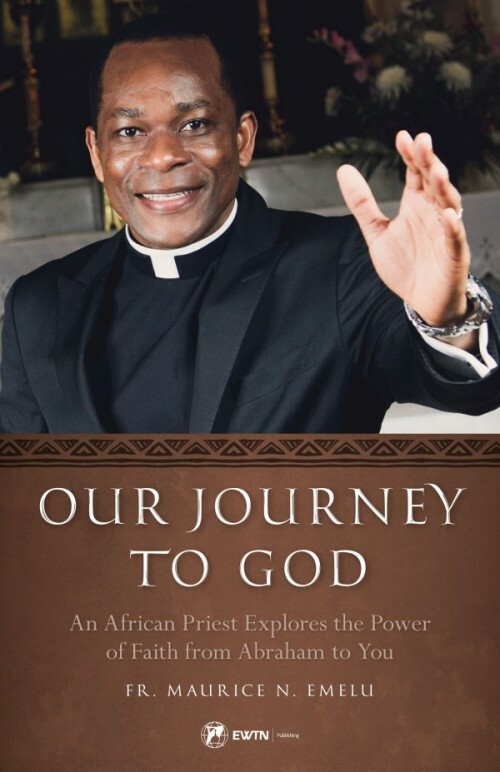 Editor’s note: This article is from a chapter in Our Journey to God: An African Priest Explores the Power of Faith from Abraham to You, which is available from Sophia Institute Press. Fr. Maurice Emelu is a priest from the Diocese of Orlu, Nigeria and is the founder of Gratia Vobis Ministries, a Catholic media apostolate dedicated to evangelization and charity for the poor. Fr. Maurice also hosts the television show Word for a Wounded World on EWTN.